4 Foot Show and Write Kit. Double the value with two versatile panel options in one display. Fully enclosed, plastic frame with rigid panels. 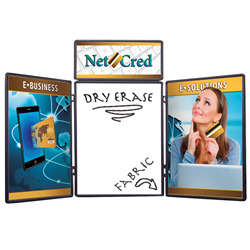 Show N Write has Velcro receptive fabric panels (Black) on one side and dry erase board on the other. Lightweight and portable. Great for presentations, recruiting, proposals and sales meetings.